This breed of Rizzlyg is designed for milk and meat production. 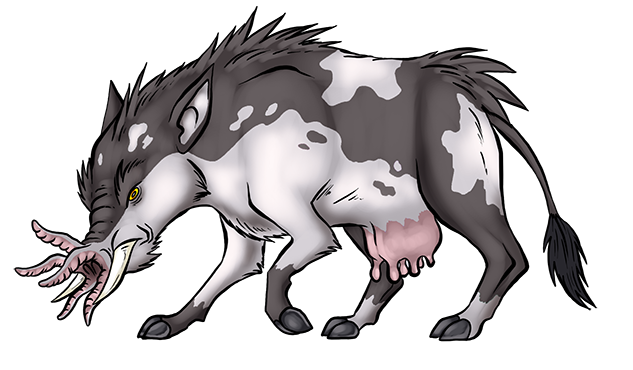 Its anatomy is less work and combat oriented than the standard breed, with a thinner skull, a longer muzzle, straighter tusks, a less muscular frame and a slightly atrophied nucleus. It is also less territorial, making it easier to tame. For these reasons, it has a lower rank despite being of a similar size. Its milk is not merely delicious and fortified with vitamins and nutrients, it also has medicinal properties, boosting the immune system and soothing the digestive tract. Though usually white, Rizz Milk can also become blue or pink depending on the content of its diet.